Matt’s store is sometimes visited by this lovely neighborhood cat. 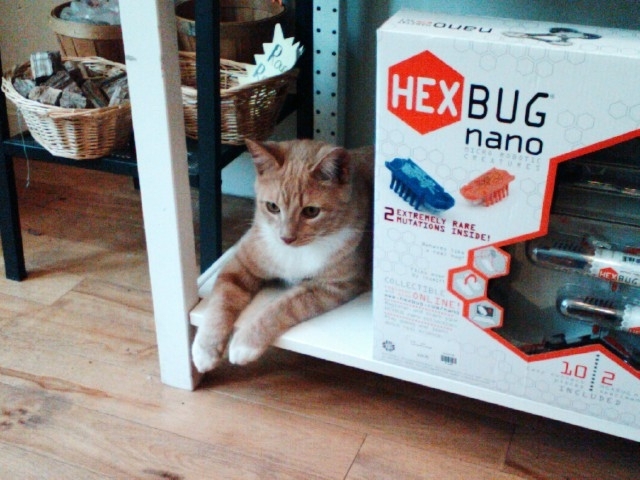 She obviously has a home, but she is a fan of science education and so welcome to come browse whenever she chooses. You don’t find this at Wal Mart! I buy my mom terrific magnifying lenses here, which help her continue living well despite having macular degeneration. Young relatives and children I know adore the gifts I send that just can’t be found on the shelves of Wal Mart. The store is great fun, who can resist a science/toy/education store? But the staff is what makes it. When I didn’t know just what magnifying lenses would be right to order for my mom, Matt was able to answer all my questions and pick out just what was needed. He knows the products he sells. I also had to order a gift for a child of 6 that was going to be recovering from surgery for many weeks. Something a child could do in bed, that would be more than just watching TV. Matt came up with a terrific suggestion, that proved to be a BIG hit. I’m looking to order a good weather station soon, and I know I’ll be asking Matt, “which one do you recommend?” Do I need a weather station thingy? No, but my big boy husband NEEDS one. He thinks it would be “cool” to have one. So, if you want to support science education, plus the bravery of a man in a bad economy that opened a store in downtown Philadelphia, have a browse at his web site or stop on in! Unlike the big box store, Matt will be glad to help you with your purchase. Plus, Matt has supported skeptics and science education over the years he’s been very generous with donations from his terrific store. Anyone that remembers the laser pointers at TAM one year, that got a little bit out of hand, has Spectrum Scientifics to thank for supplying them to everyone that attended. I’m not going to mention the fun color changing pencils! « Chinese New Year Nightmare, when a mouse finds out she is a pig!